For the sea angler there is a huge range of bait available and much of it is free! A stroll along the tide line and an exploration of rocks or jetty walls will reveal a multitude of tasty snacks for fish. 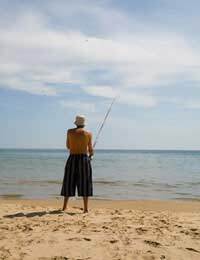 There are two categories of bait for the sea angler to use: natural bait artificial bait. There is a basic rule to remember when using natural bait. If the bait is fresh you will stand a better chance of catching fish. This creature gets its name because it sheds or peels its skin during various stages of growth. Peeler crabs are found in estuaries at low tide and are popular bait for flatfish and cod. If you are not going fishing straight away keep the crabs fresh by placing them in a bucket and covering with wet seaweed. The lugworm and the ragworm are standard bait for most sea anglers. Most tackle shops will sell dried or frozen samples but it's better to find fresh worms on the beach. Look out for blowholes and worm casts on wet sand near the tide line and, with a garden fork and bucket, collect your own supply. Many species of fish such as cod, flounder, dab, plaice and whiting will readily take lugworm and ragworm. A word of warning: take care when handling king ragworm, they have pincers and can give a nasty bite! These fish can be spotted swimming in harbours and next to jetty walls. They are superb bait for bass and pollack. Mount the sandeel on a single hook and this will permit them to behave naturally in the water and therefore be more tempting to predators. Rocks at the seashore are covered with shellfish and at low tide will provide an abundant supply of free bait. Cockles are small but two or three on a hook will attract dabs. Take a sharp knife to prise off limpets. They are another good bait for flatfish. Mussels are widely used for cod and pollack. Try wrapping thin cotton around shellfish to keep them on the hook. This is a useful bait and can be bought from the fishmonger. Herring is an oily fish and when sliced and put on the hook will give off a strong odour. Strips of herring will attract large predators and scavengers such as ling and conger eel. These are made from thin metal and when they are reeled in through the water will shine, spin and vibrate. This movement imitates a vulnerable fish and will fall prey to bass, mackerel and pollack. Feathers come in sets of any number from three to more than ten. They are colourful and when pulled or jerked through the water they simulate a shoal of fry. Feathers can be fished from boats, rocks and jetties and are popular bait used by mackerel and pollack anglers. This bait is made from colourful strips of rubber. They resemble small squid and are very effective for cod and ling when fished from a boat. Lifting and lowering the rod will give movement to the muppets. If muppets are unsuccessful, they apparently also make attractive earrings!